Rome Built in a Day? I grew up on that proverb. My mother would say it any time progress toward a desired goal met an obstacle. I learned to have patience and a philosophical attitude toward life, and to value processes as much as achievements. And now, someone HAS built Rome in a day. Read the story here. She got a friend to help her. Projects are much less daunting when you’re not alone. She scaled down “the ideal.” It looks like her Rome fits on a table top, and she used paper and wood. She approached it as play, with curiosity. She didn’t know how it would turn out. She lowered her standards. She created something that pleased herself. She’s apparently not too worried about what anyone else thinks of it. This story appeals to me because it resonates with the Feldenkrais Method. Although the work has many benefits for people who desire pain and stress reduction, and improvements in posture, coordination, and well-being, I also value this work as a method of learning and problem-solving. The Feldenkrais Method is useful for anyone who is dealing with overwhelm, or even with just “whelm.” We have so much on our individual plates — work, family, relationships, deadlines, projects, goals, physical issues — that easy proverbs and platitudes lose their ability to encourage us. The Feldenkrais Method teaches a comprehensive approach for thought combined with intelligent action. The teacher or practitioner is not in the role of “therapist,” but rather more like a tour guide. I’m there to help, to witness, and to acknowledge. I’ve got a map, and I know the landmarks of your experience. There’s much you can do for yourself with this type of assistance. By “scaling down the ideal,” the task, whatever it is, becomes more manageable. Remove your pre-conditions and pre-judgments, and see what happens. Many small steps lead surely to your goal. Celebrate each one. For example: you don’t have to redesign your entire filing system TODAY. Spend 5 minutes trashing the junk mail. Want to keep something? Find, or make a file folder and file it. You’ve made progress. Get curious and “muck about.” Experiment and explore. You will find unexpected resources as you go. You’ll discover how creative you are. By “lowering your standards,” you make space for change to begin. If everything has to be perfect, or nothing — frequently you are left with nothing. Action stalls out under the judgement of perfection, and always comes up short. Anything worth doing is worth doing badly. After you have begun, you have surmounted the biggest obstacle. Improvement is inevitable. Whether you are a skilled high-achiever at the top of your form, or a person with serious challenges, you can benefit from working with the Feldenkrais Method. As you become more aware of what you are doing, you become more adept, more adaptable, more effective. 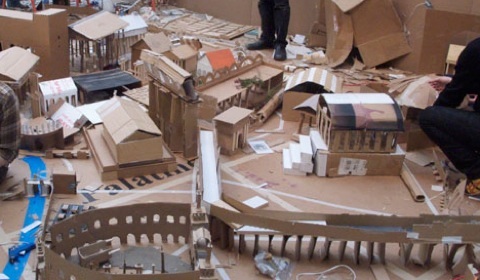 You can “build your own Rome,” whatever that looks like. Let’s get started!